Changi Rise is a brand new development just completed in 2004. It is tropical resort residence that changes the way you think of home. Eleven tower blocks of nine or ten storeys each, house a total of 598 apartments offering a selection of 2, 3 and 4 bedroom units and penthouses. Drive through the tree-lined boulevard or stroll across a wooden walkway over a tranquil pond. A wonderful vision of your new home within a tropical paradise. Every convenience is close at hand. The Simei MRT is just walking distance away, and the PIE, TPE and ECP are around the corner to whisk you away to any part of the city. There's a wide variety of shopping options - Eastpoint Mall, Century Square, Tampines Mall and more. You'll be delighted that some of the best schools and educational institutions are around the corner too. Step into the magnificent glass-fronted clubhouse with its own lobby, gym, games room and function areas that overlooks lush tropical landscaping. Indulge in the unhurried ambience of the extensive lagoon pool amidst soothing sounds of underwater music or sun-bathe on raised sun-decks under shady palms. A thrilling game at the tennis courts or a zesty workout at the fitness corners are energetic recreational options in this spectacular garden retreat. Changi Rise Condominium features the very finest of finishes. The kitchen is fully equipped with specially designed cabinets complete with hob, hood and built-in oven. All the bedrooms come with generous wardrobe space and split air-conditioning. This building is the definition of luxury. The pool is ginormous, the houses are glamourous and the rooms are spacious. The location is precise and perfect whilst there are nearby malls, supermarkets and grocery stores. It has all you need. Can the officer in charge, to re-arrange the morning gardener/general worker not to use air blower to blow dry leaves instead use the normal sweeping along the main road daily in the morning. The noise created is causing frustration and unbearable level especially to baby, old forks and people of medication. 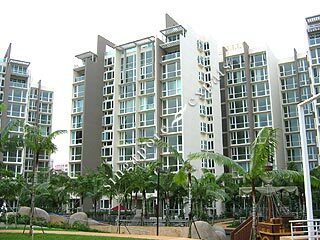 Changi Rise Condo is a value for money, very quite and just a tropical paradise .. Lush green .. The best condo around, Best for Expats.